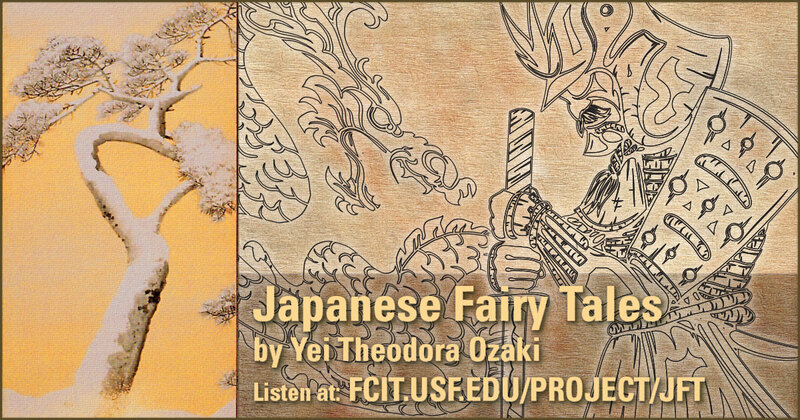 Use this banner on social media to share our audio collection of Japanese Fairy Tales. 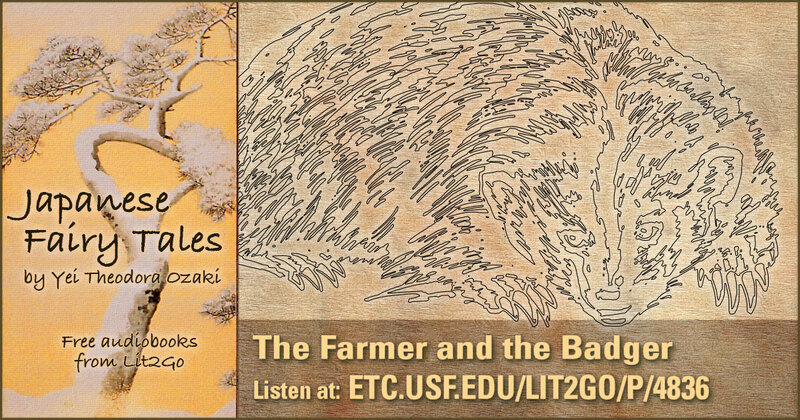 The Farmer and the Badger from the Lit2Go audiobook collection. A badger kills a farmer’s wife, and the farmer asks a rabbit to get revenge for him. Duration: 11 minutes. Reading level: 6.8. Word count: 2,479. 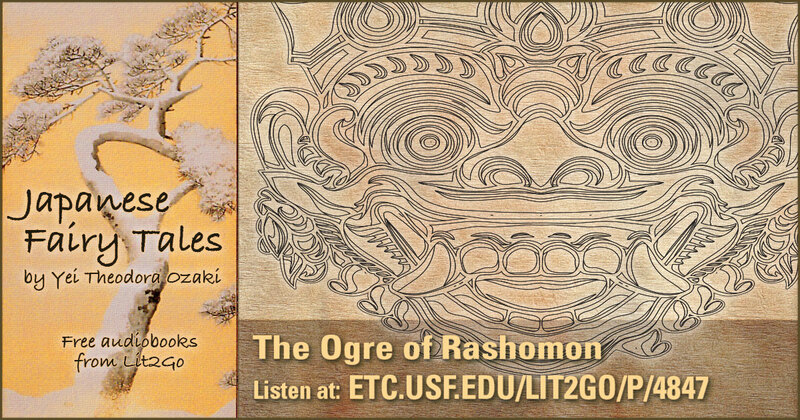 The Goblin of Adachigahara from the Lit2Go audiobook collection. A priest looks for lodging in the night and is given shelter by an old woman. She goes to gather more wood, and she tells him not to look in the back room. Curiosity gets the better of him, and he looks in the room and sees horrible things. 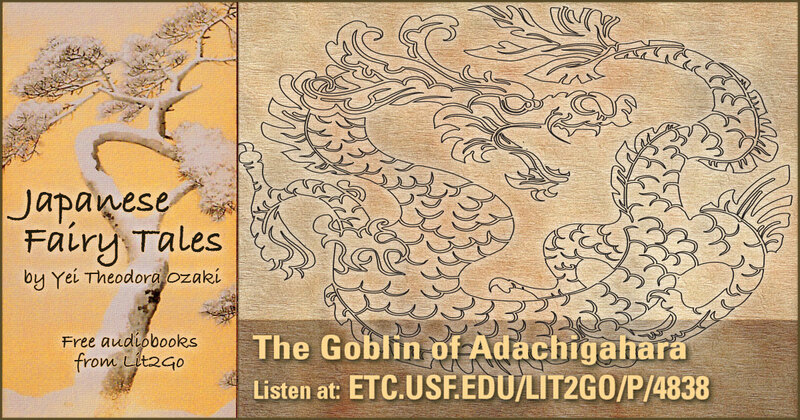 He realizes she is the Goblin of Adachigahara, and flees. Duration: 8 minutes. Reading level: 6.2. Word count: 1,782. 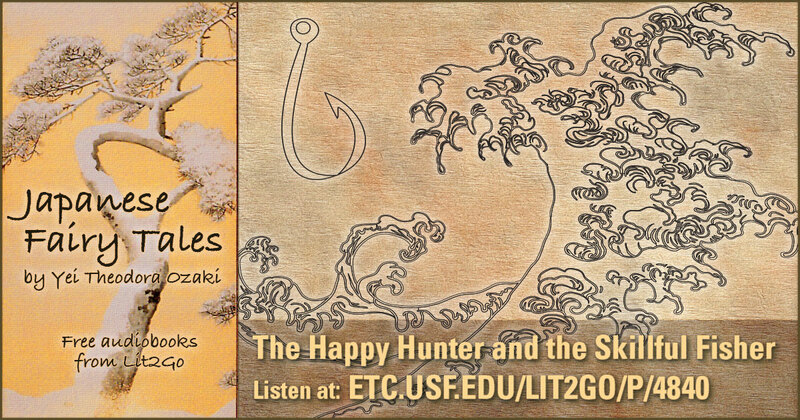 The Happy Hunter and the Skillful Fisher from the Lit2Go audiobook collection. The brothers The Happy Hunter and The Skillful Fisherman change occupational places one day. The Hunter does not know how to fish, and loses his brother’s hook. The Skillful Fisherman is very angry and demands his hook back. The Hunter searches and searches to no avail, until an old man appears and tells him to travel to the Sea King’s realm to find the hook. He does so, and finds the hook and makes many new friends. Duration: 29 minutes. Reading level: 8.2. Word count: 6,512. 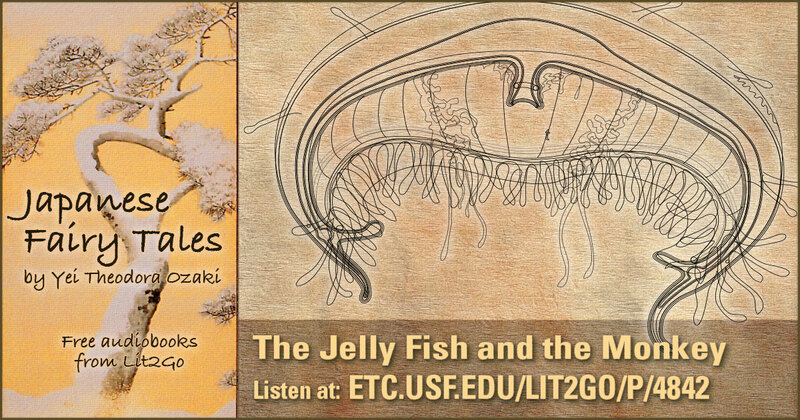 The Jelly Fish and the Monkey from the Lit2Go audiobook collection. The jelly fish, who originally had a shell and four legs, fails in a mission for the Dragon King of the Sea. As punishment his bones are removed, and he is beaten into a pulp. Thus the modern jelly fish was created. Duration: 14 minutes 38 seconds. Reading level: 6.8. Word count: 3,389. 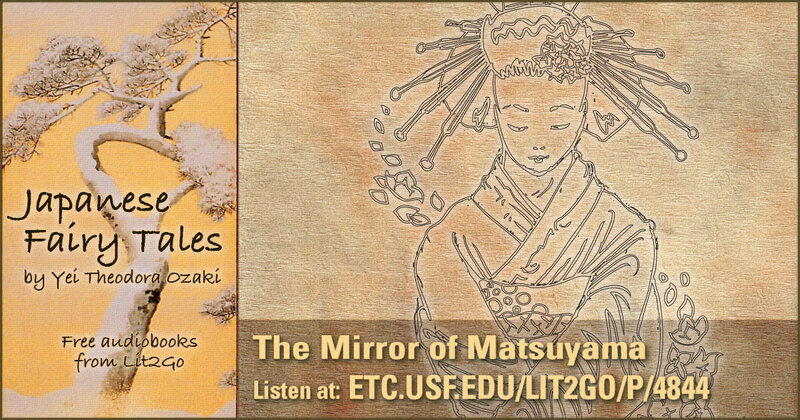 The Mirror of Matsuyama from the Lit2Go audiobook collection. A husband gives his wife a mirror, and when she is on her deathbed, she gives it to her daughter. The daughter thinks she sees her mother’s soul in it and spends much time staring into it after her father remarries. The stepmother begins resenting the daughter’s relationship with her father and starts to hate her; she thinks the daughter is doing black magic to curse her, and she tells the father of it. 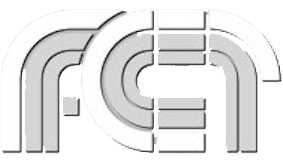 The father confronts the daughter, and he finally realizes that the daughter is innocent and is simply still brokenhearted over her mother’s death. Duration: 25 minutes. Reading level: 7.9. Word count: 5,471. 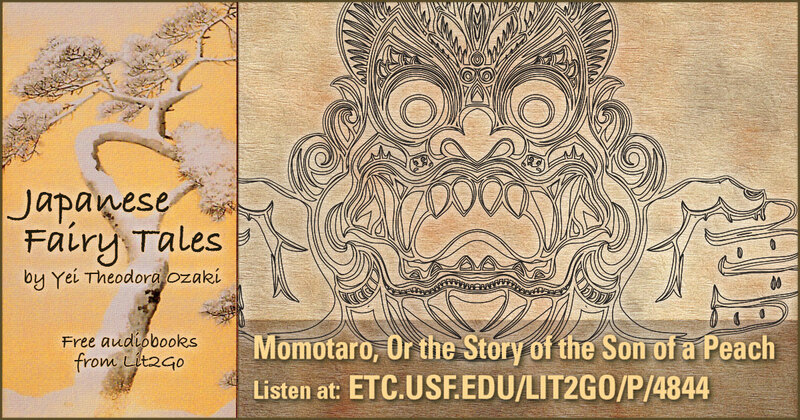 Momotaro, Or the Story of the Son of a Peach from the Lit2Go audiobook collection. 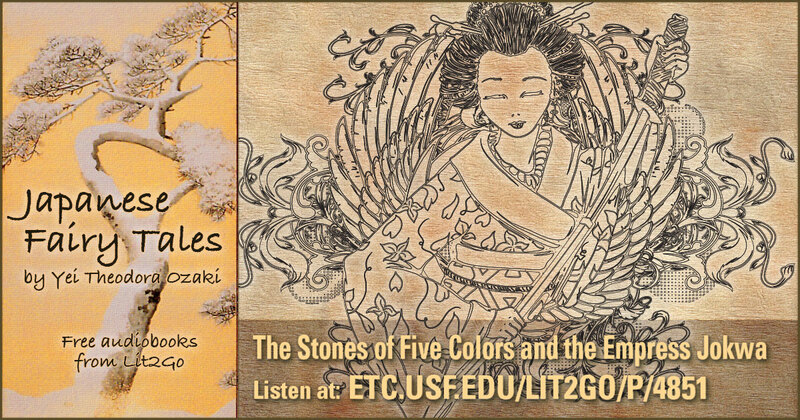 An old woman finds a large peach in a river, and when she and her husband cut it open to eat it, they find a child inside. They are overjoyed to now have a son to ease their lonely days. When the boy is fifteen, he goes off to rid the land of devils who live on an island, and takes a dog, a monkey, and a pheasant with him. He is victorious over the devils and returns home to live happily with his parents. Duration: 23 minutes 40 seconds. Reading level: 5.0. Word count: 4,609. 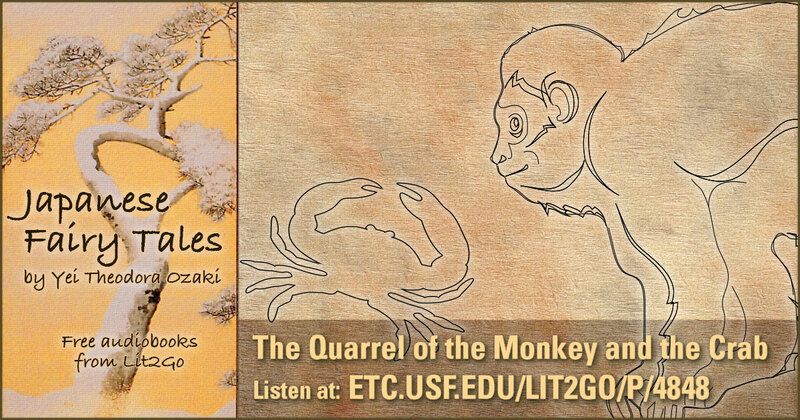 The Quarrel of the Monkey and the Crab from the Lit2Go audiobook collection. The monkey and the crab were playing along the river. 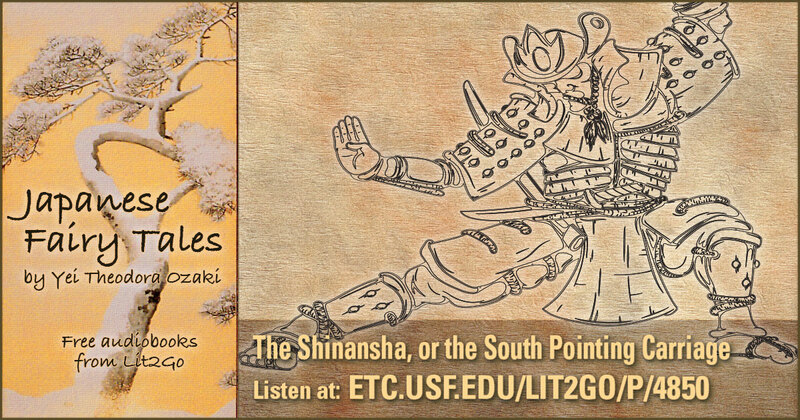 The monkey finds a persimmon seed and the crab a rice dumpling; the monkey convinces the crab to exchange the items. 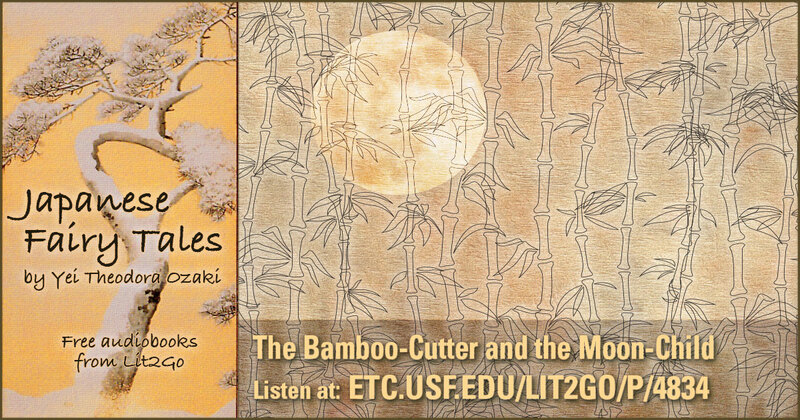 The crab grows a tree from the seed, and asks the monkey to help him pick the fruit. The monkey is greedy, and eats all the fruit and then throws hard seeds at the crab, killing him. The crab’s son plans revenge on the monkey, eventually killing him. Duration: 12 minutes 36 seconds. Reading level: 7.2. Word count: 2,800. 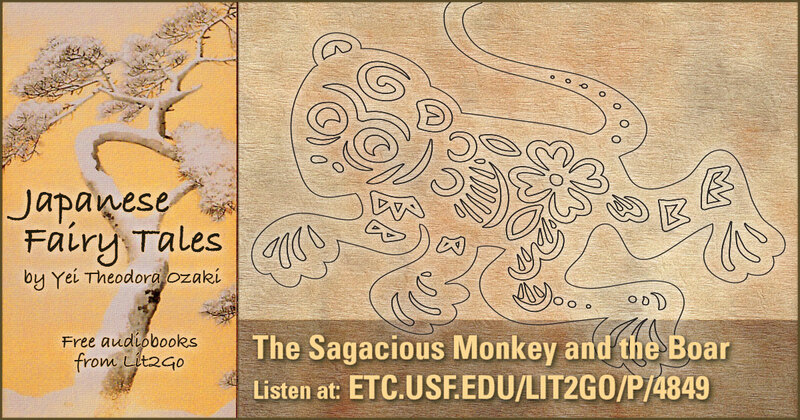 The Sagacious Monkey and the Boar from the Lit2Go audiobook collection. An old monkey is to be sent to the butcher by his master, since his age has caused him to stop performing as well as he used to. The monkey overhears this plan and goes to a boar for advice. The boar comes up with a plan: The boar will steal the couple’s child, and the monkey will run after him and rescue the child, thus earning the family’s love and respect for the rest of his days. The plan works. Duration: 4 minutes 29 seconds. Reading level: 5.7. Word count: 983. 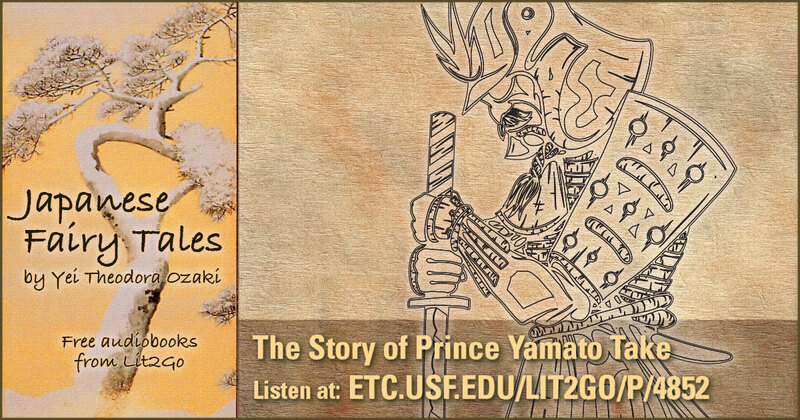 The Story of Prince Yamato Take from the Lit2Go audiobook collection. 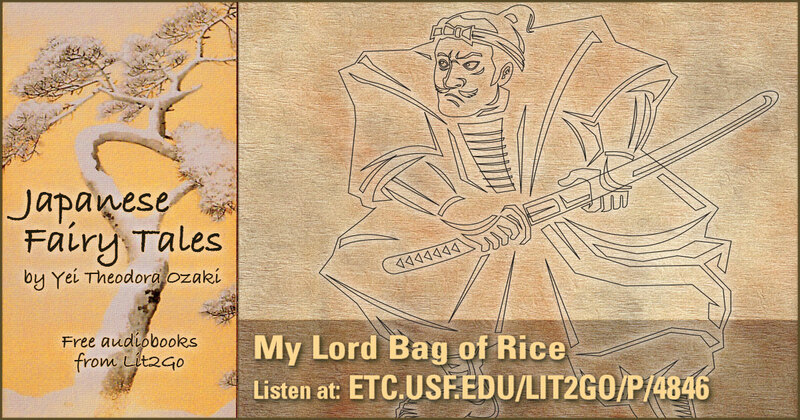 A story of how Prince Take got his name and many of his daring deeds. Duration: 29 minutes. Reading level: 10.1. Word count: 5,405. 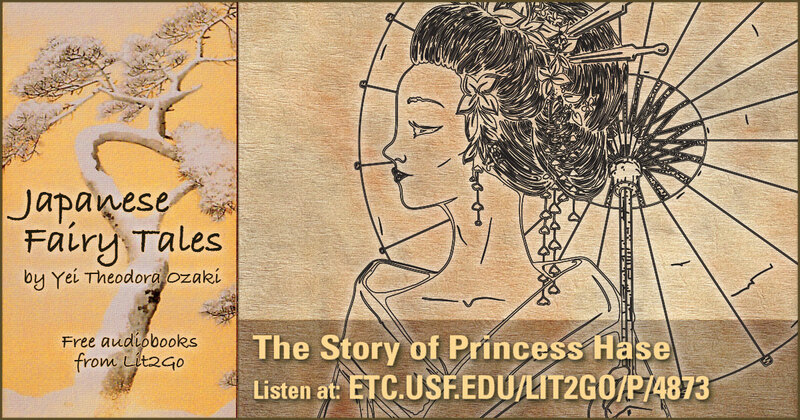 The Story of Princess Hase from the Lit2Go audiobook collection. How Princess Hase was conceived and lived her good life. Duration: 14 minutes 31 seconds. Reading level: 9.8. Word count: 3,058. 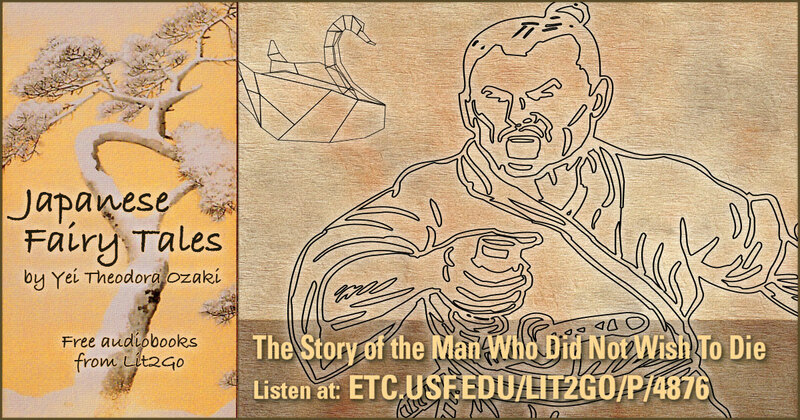 The Story of the Man Who Did Not Wish To Die from the Lit2Go audiobook collection. How Sentaro was taught not to covet unending life. Duration: 14 minutes 42 seconds. Reading level: 8.2. Word count: 2,665. 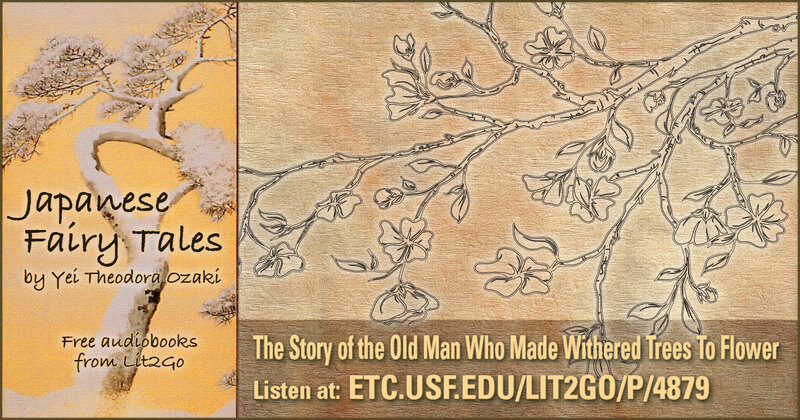 The Story of the Old Man Who Made Withered Trees To Flower from the Lit2Go audiobook collection. A childless couple love their dog very dearly, and the dog finds gold coins buried under their tree. The old man is grateful and loves his dog even more. The man has a very jealous and hateful neighbor, who tries to copy his neighbor’s luck by borrowing the dog and making him dig. The hateful man finds only garbage, and kills the dog in rage. Duration: 13 minutes. Reading level: 7.2. Word count: 2,834. 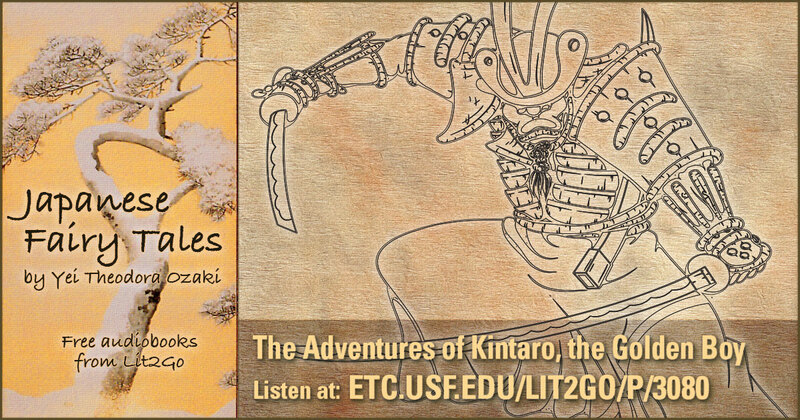 The Story of Urashima Taro, the Fisher Lad from the Lit2Go audiobook collection. 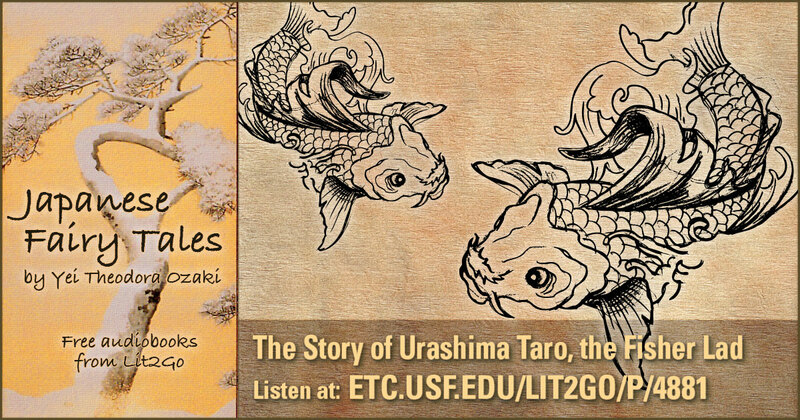 How disobedience ruined the life of Urashima Taro. Duration: 19 minutes 19 seconds. Reading level: 6.3. Word count: 4,416. 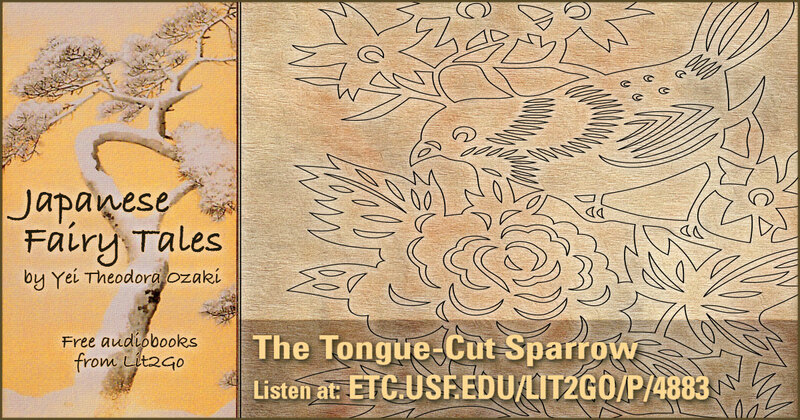 The Tongue-Cut Sparrow from the Lit2Go audiobook collection. A fairy sparrow teaches a cross old woman a lesson. Duration: 18 minutes. Reading level: 7.9. Word count: 3,466. 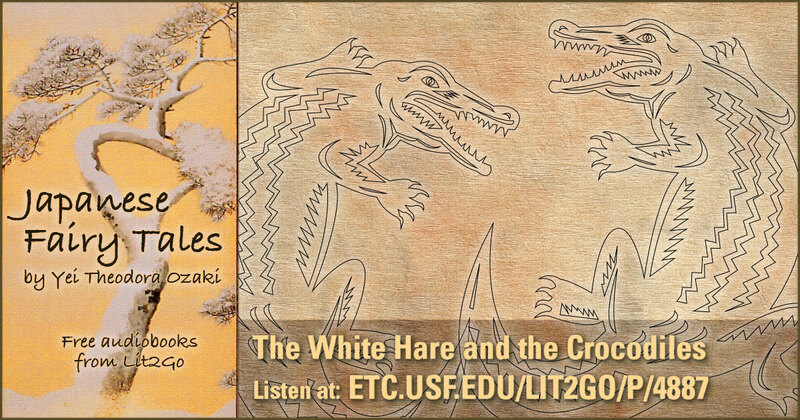 The White Hare and the Crocodiles from the Lit2Go audiobook collection. A hare deceives many crocodiles, then mocks them, and the crocodiles pull out all of his fur in retaliation. The hare is suffering, and a fairy man comes along and tells him to bathe in the sea and lie in the sun to recover his fur, but the man was spiteful and his advice only increases the hare’s pain. A kind fairy man comes by and listens to the hare’s sad story, telling him his pain is the consequence of his behavior to the crocodiles. Duration: 10 minutes. Reading level: 6.4. Word count: 2,227.